The First Generation Of The Digital Revolution Brought Us The Internet Of Information. The Second Generation- powered By Blockchain Technology-Is Bringing Us the Internet of Value: A New Platform to reshape the world Of Business And transform the old Order of Human Affairs for the Better. 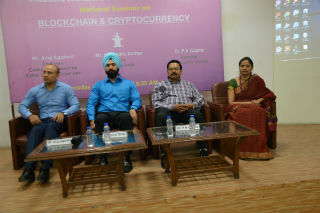 On 4th April, 2018, the Finance Club – Investofin and International Business department jointly organized national seminar on “Blockchain and Cryptocurrency”. The objective of the seminar was to impart knowledge to students on the concepts of Blockchain and Cryptocurrency, application of blockchain in different industries and sectors of the economy, and investment prospects of cryptocurrencies. Invited speakers enlightened the session with their pearls of wisdom and knowledge. In the beginning, Prof. N P Singh, Convener - Finance Club addressed the gathering through a discussion on basics of blockchain and cryptocurrency, how it came into existence and how blockchain technology can bring transformation in global banking industry. 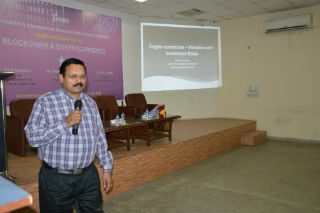 In the first discussion Dr. P K Gupta (Professor, Jamia Millia Islamia) discussed on cryptocurrencies- valuation and investment risk. 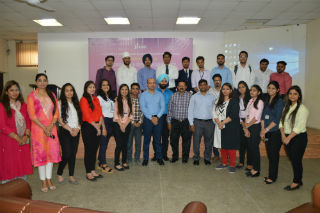 He discussed various topics like uncertainty associated with cryptocurrency, types of cryptocurrency, detailed discussion on bitcoins- historical data, simulation and portfolio VaR risk and return, conventional money theory applied to cryptocurrency, mining industry value chain, debit card TenX, geographical data, hashing technology and many more. He concluded with the point that- Bitcoin is a remarkable cryptographic achievement and the ability to create something that is not duplicable in the digital world has enormous value. Next Mr. Anuj Aggarwal (Chairman-Centre for research on cybercrime and cyber law) addressed the gathering on the topic Blockchain. He started with general questions – how many times we use internet every day, are we active on social networking sites? After this he discussed about blockchain. The blockchain is an undeniably ingenious invention – the brainchild of a person or group of people known by the pseudonym, Satoshi Nakamoto. With the ongoing time, it has evolved into something greater. Bitcoin has been called “digital gold,” and for a good reason. To date, the total value of the currency is close to $9 billion US. And blockchains can make other types of digital value, At last, Mr. Arvind Dangi delivered practical insights of transacting in cryptocurrencies and making a portfolio. 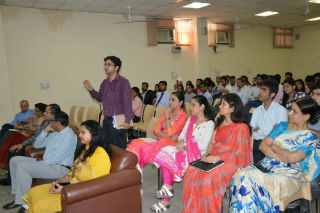 He very well handled the queries of participants and helped them enrich their knowledge base. This seminar was a source of detailed information on blockchain and cryptocurrencies. Future of money lies in digital world.